This is another recipe I got from the Hippocrates Institute in West Palm Beach that our entire family is addicted to. If you love crunchy stuff and want to have a healthy, no-guilt, fantastically good tasting and good for you cracker, than try this recipe. The cracker is made using a dehydrator at 110 degrees and considered raw. This recipe makes 5 trays. I usually double the recipe. 1. 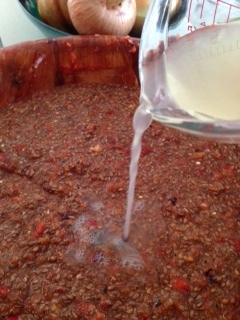 Soak the 2.5 cups of flax seed for at least 3hrs and set aside. 2. 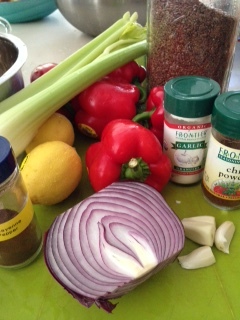 Tear the Red Pepper, Onion, Garlic and Celery into pieces/pulp. 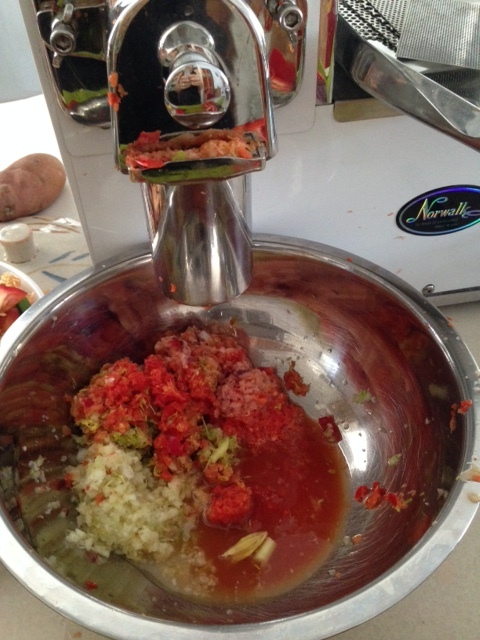 I use the Norwalk juicer triturator attachment to prep the veggies. You could use a blender, a food processor or a juicer with a blank plate for this as well, whichever method/tool works best for you. 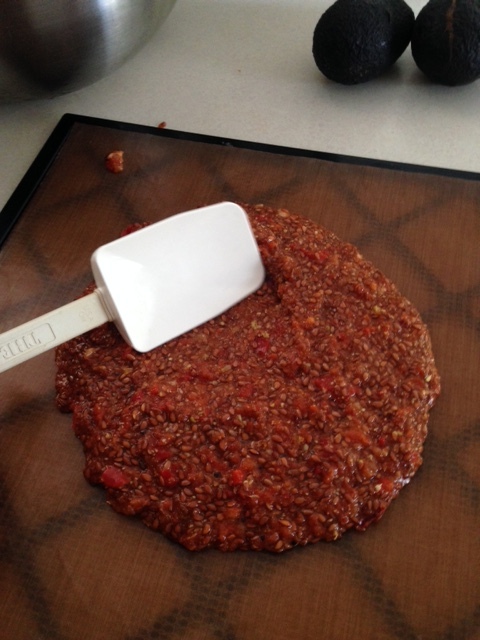 Make sure to not liquify the veggies, just turn them into tiny pieces! 3. 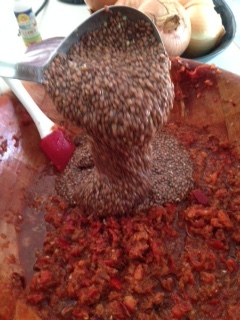 Com bine the soaked flax seeds with the pulped vegetables. 5. 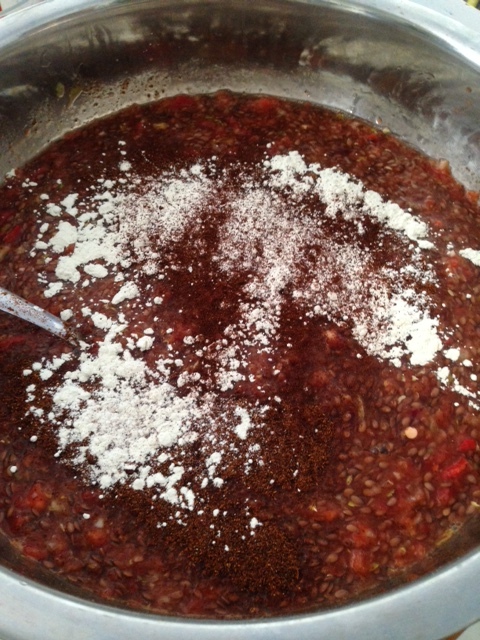 Add the lemon juice, chili powder and garlic powder (to intensify the garlic taste). Now at this point, you could also experiment with this recipe by selecting other spices (like Frontier’s Pizza seasoning etc) to make it to your liking. 6. Mix in the ground flax seed next. 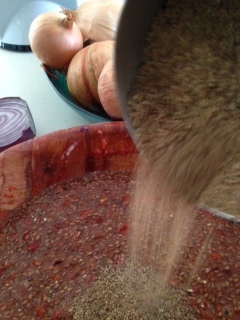 (I use a coffee grinder to grind down the flax seed). 9. 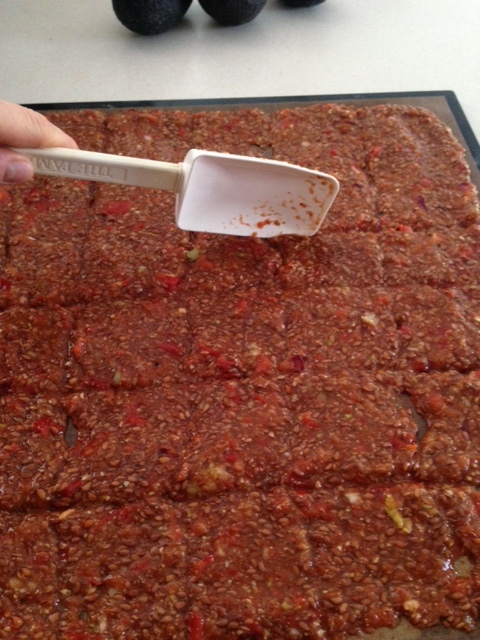 Place in the dehydrator at 110 degrees for 1 2 hours. Check the crackers and if they are ready to be peeled of the sheet, flip them on the dehydrator tray and continue to dehydrate for another 12 hours. The longer you dehydrate these crackers, the crunchier they become. (You can’t really “over-dehydrate” so don’t worry). 10. Hide half of the batch from your family. You can store the crackers in an air-tight container for several weeks, if they are not discovered beforehand. 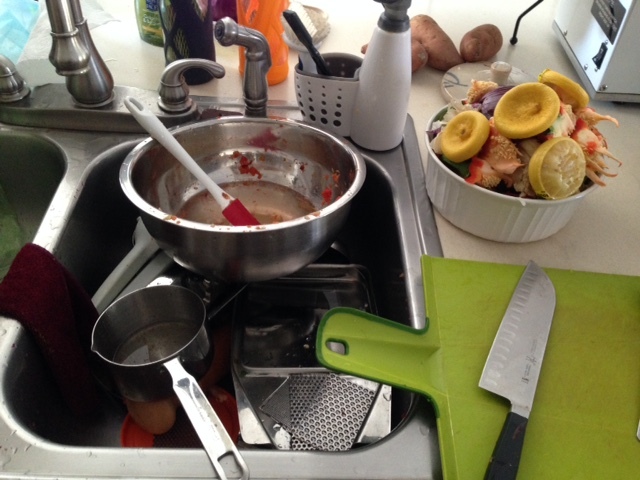 Don’t forget to do the dishes & take out the compost! You could make this recipe using an oven, however the crackers would no longer be “raw” and the enzymes would have been killed of, so even though surely they will be tasty, the food would no longer be considered a living food. Previous Post Parsnips fried or juiced – a powerhouse of nutrition!